1. Thread 1 – Antique Silver-Plated Crimp Tube onto one end of the 14 inch length Buddy Braids about a ½ inch from the end. 2. Thread the loop of the Lobster clasp onto the same end of the Buddy Braids the crimp tube is on. 3. Thread the Buddy Braids back through the crimp tube. 4. Take a pair of Crimping Pliers and squeeze the crimp tube until you cannot pull the Buddy Braids back through. Do not trim the excess; simply string the beads on both ends of the Buddy Braids. 5. Add 1 – Antique Silver-Plated Crimp Cover by placing it over the crimp tube and squeezing it closed. a. 1 - Pink AB 4mm Crystal Bicone, 1 - Antique Silver-Plated 1.5x4mm Beaded Rondelle, 1 - Pink Crazy Lace Agate 6mm Semiprecious Round, 1 - Antique Silver-Plated 2x6mm Beaded Rondelle, 1 - Rose Quartz 8mm Semiprecious Round, 1 - Antique Silver-Plated 2x6mm Beaded Rondelle, 1 - Pink Crazy Lace Agate 6mm Semiprecious Round, 1 - Antique Silver-Plated 1.5x4mm Beaded Rondelle, 1 - Pink AB 4mm Crystal Bicone, and 1 - Antique Silver-Plated 6x7mm Beaded Spacer. b. Repeat step (a.) four times. c. 1 - Pink AB 4mm Crystal Bicone, 1 - Antique Silver-Plated 1.5x4mm Beaded Rondelle, 1 - Pink Crazy Lace Agate 6mm Semiprecious Round, 1 - Antique Silver-Plated 2x6mm Beaded Rondelle, 1 - Rose Quartz 8mm Semiprecious Round, 1 - Antique Silver-Plated 2x6mm Beaded Rondelle, 1 - Pink Crazy Lace Agate 6mm Semiprecious Round, 1 - Antique Silver-Plated 1.5x4mm Beaded Rondelle, and 1 - Pink AB 4mm Crystal Bicone. 7. Thread 1 - Antique Silver-Plated Crimp Tube and the end hole of the Antique Silver-Plated 13x4mm 4-Hole Spacer Bar. Thread the Buddy Braids back through the crimp tube and the last several beads. See below. Pull the Buddy Braids snug, using your pliers squeeze the crimp tube about a 1/4th of an inch away from the 4-Hold Spacer Bar and a 1/8th of inch away from the last bead to have room for your crimp cover. Trim the excess wire as close to the bead as you can. 8. Add 1 – Antique Silver-Plated Crimp Cover by placing it over the crimp tube and squeezing it closed. 9. Thread 1 – Antique Silver-Plated Crimp Tube onto one end of a 10 inch length Buddy Braids about a ½ inch from the end. 10. Thread the split ring onto the same end of the Buddy Braids the crimp tube is on. 11. Thread the Buddy Braids back through the crimp tube. 12. Take a pair of Crimping Pliers and squeeze the crimp tube until you cannot pull the Buddy Braids back through. Do not trim the excess; simply string the beads on both ends of the Buddy Braids. 13. Add 1 – Antique Silver-Plated Crimp Cover by placing it over the crimp tube and squeezing it closed. b. Repeat step (a.) two times. c. 3 – 1 - Pink AB 4mm Crystal Bicone, 1 - Antique Silver-Plated 1.5x4mm Beaded Rondelle, 1 - Pink Crazy Lace Agate 6mm Semiprecious Round, 1 - Antique Silver-Plated 2x6mm Beaded Rondelle, 1 - Rose Quartz 8mm Semiprecious Round, 1 - Antique Silver-Plated 2x6mm Beaded Rondelle, 1 - Pink Crazy Lace Agate 6mm Semiprecious Round, 1 - Antique Silver-Plated 1.5x4mm Beaded Rondelle, and 1 - Pink AB 4mm Crystal Bicone. 15. Thread 1 - Antique Silver-Plated Crimp Tube and the Antique Silver-Plated 8mm Jump Ring. Thread the Buddy Braids back through the crimp tube and the last several beads. See below. Pull the Buddy Braids snug, using your pliers squeeze the crimp tube about a 1/4th of an inch away from the jump ring and a 1/8th of inch away from the last bead to have room for your crimp cover. Trim the excess wire as close to the bead as you can. 16. Add 1 – Antique Silver-Plated Crimp Cover by placing it over the crimp tube and squeezing it closed. 17. Add 1 - Rose Quartz 10mm Semiprecious Round to a ball pin. Create a loop in the ball pin. 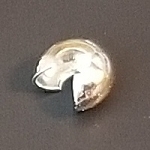 Make a 90° bend in the ball pin above the bead. Using round nose pliers and hold the ball pin near the angle and bend it around the pliers to make a loop. Wrap down around ball pin creating as many coils as you can. Trim any extra. Repeat 2 times for all drops. 18. Take three of the 10 inch lengths of Buddy Braids and thread all of them through 1 – Antique Silver-Plated Crimp Tube about a ½ inch from the end. 19. Thread the Antique Silver-Plated 8mm Jump Ring from Step 15 onto the same end of the Buddy Braids the crimp tube is on. 20. Thread the Buddy Braids back through the crimp tube. Squeeze the crimp tube closed. 21. Add 1 – Antique Silver-Plated Crimp Cover by placing it over the crimp tube and squeezing it closed. 22. 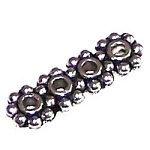 Thread 1 - Antique Silver-Plated 6x7mm Spacer Bead on all three strands of Buddy Braids. 23. Thread each of the lengths of Buddy Braids through the Antique Silver-Plated 23x10mm 3-1 Connector one length at a time getting each of them through first the single hole then the three hole side. a. 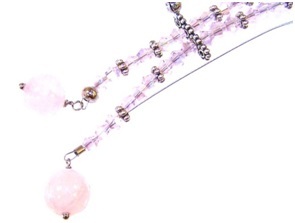 2 - Pink AB 4mm Crystal Bicones, and 1 - Antique Silver-Plated 1.5x4mm Beaded Rondelle. b. Repeat pattern in Step (a.) six times. d. Thread the Buddy Braids through the Antique Silver-Plated 13x4mm 4-Hole Spacer Bar going through the hole next to the one you attached to the necklace in Step 7.
a. 2 - Pink AB 4mm Crystal Bicones, 1 - Antique Silver-Plated 1.5x4mm Beaded Rondelle, 2 - Pink AB 4mm Crystal Bicones, 1 - Antique Silver-Plated 1.5x4mm Beaded Rondelle, and 2 - Pink AB 4mm Crystal Bicones. 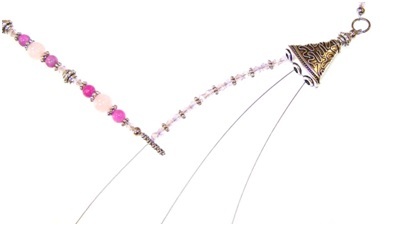 b. Thread 1 - Antique Silver-Plated Crimp Tube and the loop of 1 - Rose Quartz 10mm Drop you created in Step 17. Thread the Buddy Braids back through the crimp tube and several of the last beads you threaded. See Below. 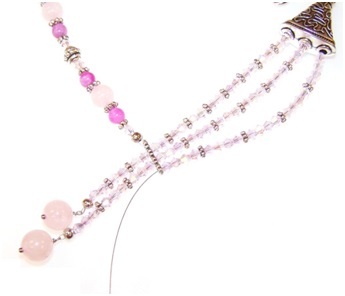 Pull the Buddy Braids snug, using your pliers squeeze the crimp tube about a 1/4th of an inch away from the Rose Quartz Drop and a 1/8th of inch away from the last bead to have room for your crimp cover. Trim the excess wire as close to the bead as you can. 26. Add 1 – Antique Silver-Plated Crimp Cover by placing it over the crimp tube and squeezing it closed. a. 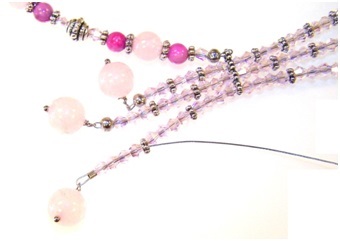 3 - Pink AB 4mm Crystal Bicones, and 1 - Antique Silver-Plated 1.5x4mm Beaded Rondelle. b. Repeat pattern in Step (a.) four times. d. Thread the Buddy Braids through the Antique Silver-Plated 13x4mm 4-Hole Spacer Bar going through the hole next to the one you did in Step 25.
a. 3 - Pink AB 4mm Crystal Bicones, 1 - Antique Silver-Plated 1.5x4mm Beaded Rondelle, 3 - Pink AB 4mm Crystal Bicones, 1 - Antique Silver-Plated 1.5x4mm Beaded Rondelle, and 3 - Pink AB 4mm Crystal Bicones. 29. Add 1 – Antique Silver-Plated Crimp Cover by placing it over the crimp tube and squeezing it closed. a. 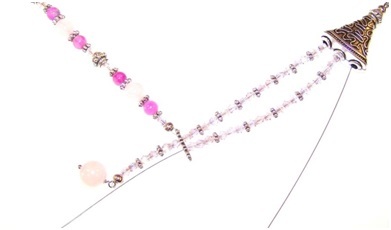 4 - Pink AB 4mm Crystal Bicones, and 1 - Antique Silver-Plated 1.5x4mm Beaded Rondelle. b. Repeat pattern in Step (a.) three times. d. Thread the Buddy Braids through the Antique Silver-Plated 13x4mm 4-Hole Spacer Bar going through the last hole. a. 4 - Pink AB 4mm Crystal Bicones, 1 - Antique Silver-Plated 1.5x4mm Beaded Rondelle, 4 - Pink AB 4mm Crystal Bicones, 1 - Antique Silver-Plated 1.5x4mm Beaded Rondelle, and 4 - Pink AB 4mm Crystal Bicones. 32. Add 1 – Antique Silver-Plated Crimp Cover by placing it over the crimp tube and squeezing it closed. You are done! This pattern makes a necklace that is approximately 22 inches long. 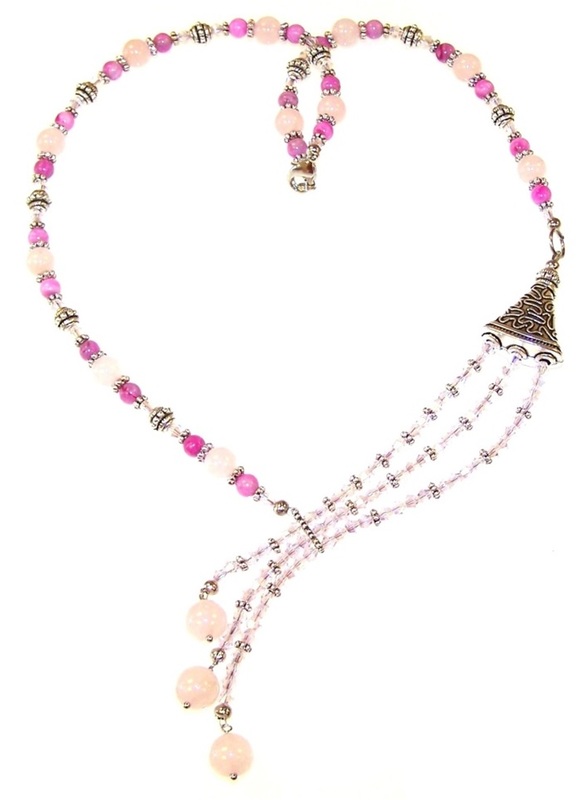 Forever In Love Beaded Necklace is a single strand necklace that turns into 3 strands using one of our multi-strand connectors. You can use this pattern with any colors you like to create a very stylish piece of jewelry.